Salad Days: vegan buckwheat pancakes! I'll excuse the time it took to post this by saying these particular pancakes were a work requiring immense development to get them to the stage of perfection you will find them to be at upon producing them. But that would be a lie. In fact, the photo you see below was taken several months ago - and the recipe was easy as piecakes! Well, as easy as googling "vegan buckwheat pancakes" and chopping and changing from there. approximately 1/2 cup of water, give or take. Super easy directions - mix the dry ingredients, add the wet ingredients! Using a whisk helps to create a smooth and bump free batter. You need to let it sit for about 10 minutes because the flax is supposed to be substituting eggs and it takes roughly this long for them to develop their eggy qualities in the recipe (thickening it up and whatnot). You can use this time to get your toppings ready - chopped fruit and nuts, berry coulis (wizz up some berries in a blender with a touch of sweetness - a date works well - and some vanilla), jams and maple syrup and hemp seeds if you have them. Heat up a good sized pan over medium heat and melt some coconut oil. Use a ladle to measuring cup to pour out the batter (less messy and makes good circles unless you're into fancy or otherwise shaped pancakes). Cook until bubbles appear and flip (important to leave them until they are bubbly as! It took me countless flippings of half cooked, batter exploding pancakes to get it right), then cook the other side for another couple minutes. You can keep them warm by keeping the plate of pancakes in the oven or covering with a teatowel. Serve with prepared toppings and go wild! Et voila! 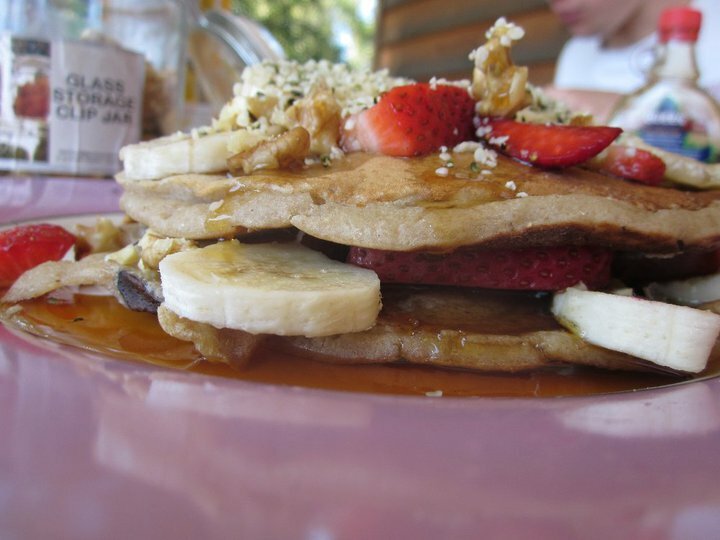 This recipe allows you to indulge in delicious pancakes which in addition to providing several taste sensations also provide you with fibre, protein (from the grain flours and plant milks and nuts/seeds), healthy fats (from the flaxseeds and coconut oil and nuts/seeds) and a variety of vitamins, minerals and antioxidants from everything! Really an excellent breakfast to get your day started. You could potentially make this a gluten free recipe by substituting gluten free flour instead of spelt. I haven't tried this variation but you could use quinoa flour or one of the commercially prepared flours available. Recipe adapted from: The Clean Eating Mama. Thanks! great recipe. i made these this morning, they were delicious! so fluffy and amazing. had them with strawberries, raspberries, lemon and maple syrum. yummmmmmm. these look great, v handy to have a vegan recipe on hand, thanks! & thanks for the clean eating mama link, haven't seen her blog before.